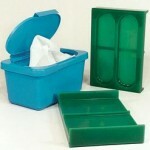 A lightweight, castable urethane tray eliminates the constant production interruptions caused by the cracking of thermoplastic trays previously used in the manufacture of ‘baby wipes’. The cracking-caused by vibration-seriously affected sensitive weight readings resulting in inaccurate quantities of solution to be sprayed onto the wipes. Whether you are designing a new material handling piece of equipment or need to replace an old one, American Urethane, Inc. is the company you can trust to deliver a quality custom-molded urethane part, on time, and at a reasonable price.